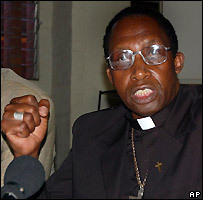 The BBC's Grant Ferrett wrote this profile of Pius Nube before he resigned as Archbishop of Bulawayo following an adultery scandal. Zimbabwe's Roman Catholic Archbishop of Bulawayo Pius Ncube accepts he may lose his life opposing Robert Mugabe, as he calls for Zimbabweans to overthrow their president. In fact, he may appear to embody a contradiction. On the one hand he is a deeply religious man who constantly stresses his belief in non-violence. In what little spare time he has he likes to read biographies of inspirational leaders, such as Mahatma Gandhi and Desmond Tutu. Yet on the other hand, he is prepared to urge his fellow Zimbabweans to join him in their thousands in street protests, even at the risk of being killed. The problem with Zimbabweans, he says, is that they are not brave enough - and he includes himself in that category. Pius Ncube is impatient. He wants change now. To understand that impatience, and his apparently contradictory nature, the archbishop told me you have to go back to his time as a young Roman Catholic priest in Matabeleland, in south-west Zimbabwe in the early 1980s. The country had just gained independence after a civil war which resulted in defeat for the white minority government. The new prime minister, Robert Gabriel Mugabe, won international acclaim for his message of reconciliation. But Mr Mugabe was determined to stamp out any potential threats to his new government. He suspected his former rivals in Matabeleland of plotting against him, and launched the Gukurahundi campaign. An estimated 20,000 people were killed, most of them civilians. Pius Ncube witnessed the suffering and was desperate to speak out. But his superiors in the Roman Catholic Church told him to keep quiet. Now that he is in charge, Archbishop Ncube is determined not to watch in silence again. And his suspicion of Robert Mugabe and other senior political figures goes back still further. After being ordained as a priest in 1973, Pius Ncube worked in rural areas of what was then Rhodesia through the civil war. He says he saw first-hand the "rough side" of what he refers to as the "so-called liberation struggle" - the fact that those with weapons could trample on the rights of civilians. True liberation, he believes, requires respect for what he calls "god-given human rights". Pius Ncube told me in his quiet, unassuming way, that his interest in the church was sparked by his mother and his aunt, both of them "strong" Christians. He was born in 1946 in Gwanda, a rural area in the south of the country, one of four children. His family moved closer to Bulawayo when he was about six years old. He was educated by Jesuits, who have a reputation as good, if sometimes rather stern, teachers. When I point out to the archbishop that the man he wants to overthrow, President Robert Mugabe, was also educated by Jesuits, he scowls. "You can't blame the Jesuits for what he has become."